Background: Patients with multiple injuries are a challenge to evaluate and to exclude abdominal injury, especially those who are intubated and sedated. Ultrasound is a screening tool and peritoneal lavage is unreliable. The aim of the study was to determine the incidence of intra-abdominal injury and describe the subsequent management after CT “panscan” in patients sustaining blunt trauma with injuries both above the thoracic and below the pelvic diaphragm. 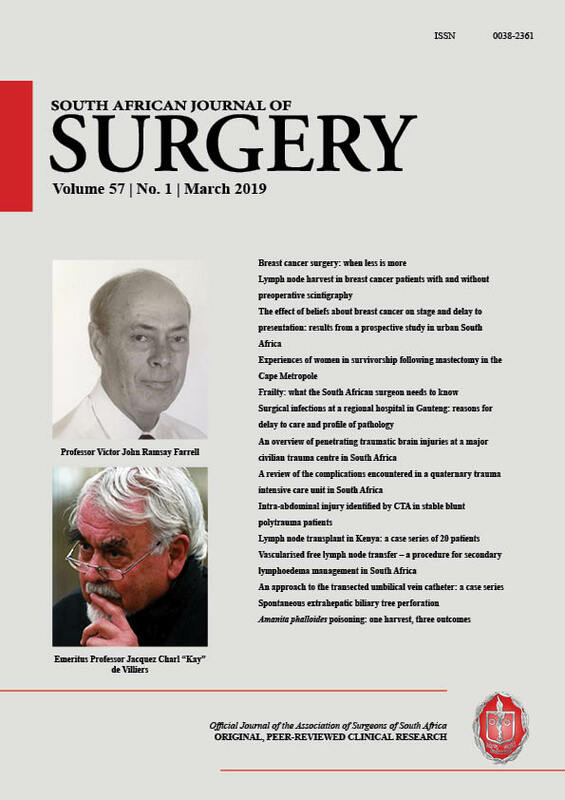 Methods: In a retrospective analysis anonymised patient data were extracted from a prospective ethics approved database of patients admitted to the level I Trauma Unit at Inkosi Albert Luthuli Central Hospital for the period from April 2007 to March 2011. Blunt polytrauma patients, aged 2 years and older with injuries above the diaphragm and below the pelvic floor were included, provided they were investigated by a full-body trauma Computed Tomography contrast study. Descriptive statistics were employed for all variables of interest, with counts/frequencies and associated percentages being reported. Results: Of 284 patients with injuries above the thoracic and below the pelvic diaphragm, 87 (30.6%) had intra-abdominal injury and 197 (69.4%) had no intra-abdominal injuries. Of those 87 patients, 54 (62.1%) were treated non-operatively and 33 (37.9%) were treated surgically with regard to their abdominal injuries. Twenty (22.9%) patients died, 4 due to intraabdominal injuries and 16 due to of extra-abdominal injuries. Nine (45%) of the twenty patients who died were treated operatively for intra-abdominal injuries and the remaining 11 (55%) were treated non-operatively. Conclusion: Around thirty percent of patients with injuries above the thoracic and below the pelvic diaphragm had concomitant intra-abdominal injuries. Of those with abdominal injury, just over half required laparotomy. For haemodynamically stable patients CT scanning identified those who require surgical intervention and those who may be managed non-operatively, therefore liberal CT-scanning is advisable for this patient group.